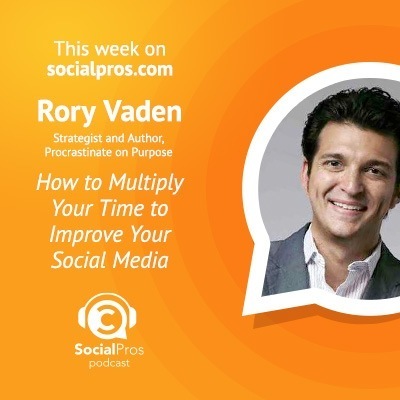 Another month, another excellent round of guests on the Social Pros Podcast. In February, we heard from Southwestern Consulting’s time management expert, a social media champion from Life Time Fitness, BroadSuite’s biggest social fan (iSocialFanz), and the Social Media Examiner himself. As always, our Social Pros draw from different backgrounds and perspectives when they join us to talk about social media as a vital source of communication and connection in today’s digital world. Despite their differences, this month’s guests agree that you need to embrace change. When something you’re doing isn’t working, let it go and move on to something else. Rory Vaden and his team at Southwestern Consulting set out to ease their clients’ pain points surrounding time management. In their surveys, research, and reflection, they realized that, “There is no such thing as time management. There is only self management.” There is only a finite amount of time that we all have to use. The key is best choosing how to divide up that time. The challenges today are certainly great, but so are the tools at hand to accomplish those results. 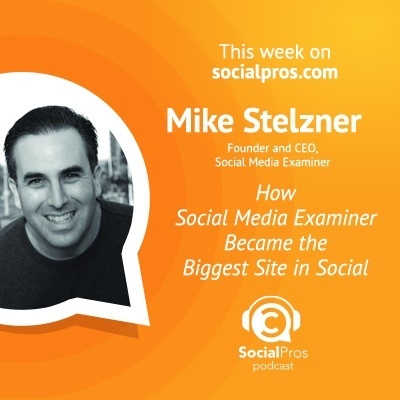 As Social Pros, we are always hearing about the latest and coolest new technology and social media tools. We’re tempted to say, “Oh my gosh, now I have to do this and I have to do this and I have to do this!” But in reality, we have to give ourselves permission to eliminate any efforts that don’t directly drive results. We can experiment and test, but if something isn’t working, we must give ourselves permission to eliminate it. 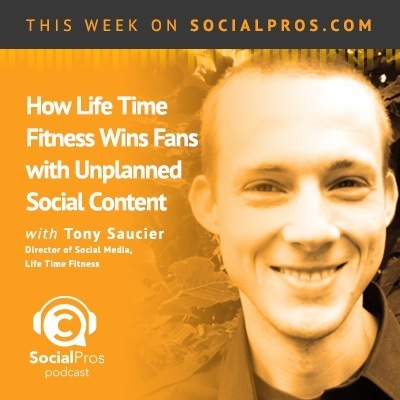 Tony Saucier works with a small social media team of five at the national level, and a huge team of 114 at the local level of Life Time Fitness. They have chosen one “social media champion” at each of Life Time’s 114 club locations to be in charge of social media for that club’s Facebook page. This strategy was developed as Tony and his team discovered their conversion numbers were skyrocketing when they started engaging at the community level. Now, they have 114 “Petri dishes” to see what content really picks up within their smaller communities. It’s the perfect way to experiment and see what works. Anything that resonates can then be used on the national social channels to share with their wider audience. Don’t overcomplicate it. Come up with ideas. Try them out. Tony and his social media team also tested four or five dozen different approaches on social media to try to figure out how to drive revenue directly. “The majority of them crashed and burned.” So what did they do? They stopped doing the things that weren’t working and put their energy into new ideas. 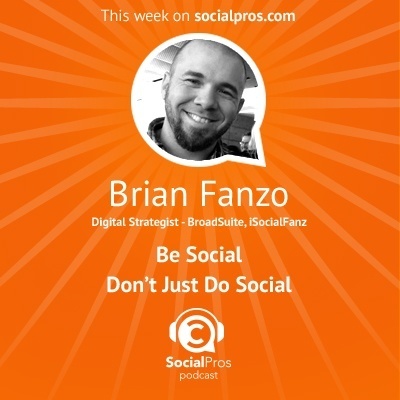 Brian Fanzo is a big fan of social media, technology, and change. He is the Chief Digital Strategist at BroadSuite, as well as a prominent thought leader as his personal brand, iSocialFanz. Through his background in technology (computer science) and role in social media, Brian has embraced change and is driven a little crazy when others don’t jump onboard when the tides turn. I love teaching people how to embrace change. I love learning how others change and adapt. Another thing Brian feels strongly about is the necessity of listening in social media. Especially when you’re just starting out, you must listen more than you talk. Brian says, “I think my biggest weapon that I use in social media, especially, is really leveraging social data and social listening.” Whether through hashtags, Twitter lists, or leveraging Google+, Brian listens to understand “not only what the community is talking about, but also what their pain points are” to better align the story he is trying to tell. It’s exciting to see more brands starting to embrace the social element of social. Instead of “me, me, me”, brands are starting to ask their audiences for feedback. Because, after all, how can we solve our audiences’ problems if we don’t know what they are? I believe in investing in things and seeing if they work, and if they don’t, moving on. Mike recommends the book Necessary Endings, by Henry Cloud. The book likens our life and work to a rosebush. We produce more than we can possibly sustain. To produce prize flowers, we have to cut off some branches to let the rosebush become what it’s truly meant to be. Mike takes this seriously and applies it to all areas of his business. If a blog isn’t getting enough page views, then he won’t keep publishing it. If he doesn’t see the engagement he wants on a social media platform, he will tweak his strategy.